BreathBuddy is a natural drug-free way to reduce stress. BreathBuddy learns your natural breathing rate with a specially designed algorithm, then coaches you through breathing exercises that are customized to bring maximal results. 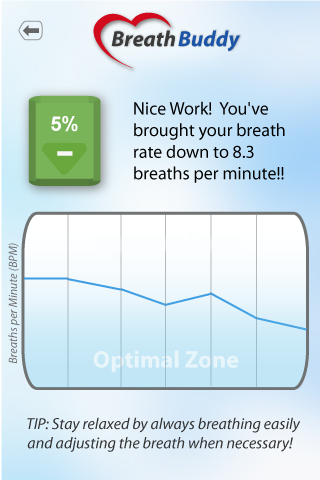 Each session gradually improves your breath rate, and BreathBuddy gives you instant feedback and charts your progress. - effortless to use – choose a session time and “go”! 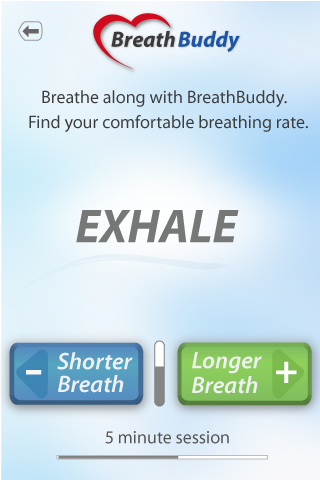 BreathBuddy works by entraining the breath with sounds that match the length of the inhale and exhale. Once BreathBuddy learns your natural breathing rate and lung capacity, it coaches you through breathing sessions that gradually lengthen the exhale – one of the most effective ways to calm the nervous system and reduce blood pressure. BreathBuddy also helps increase the tidal volume of the lungs, a key indicator of cardiovascular health. With a progress chart and insightful tips to breathe more fully, BreathBuddy encourages you to do breath sessions regularly to effectively eliminate stress and maximize benefits to your health.